Biennial species familiar as carrots in the vegetable garden, and Queen Anne's Lace along roadsides and in abandoned lots across America. 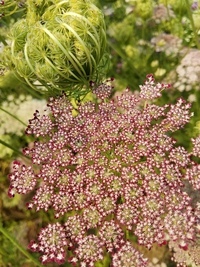 Queen Anne's Lace is sometimes referred to as "wild carrot" or the "ancestor of carrots," but this is backward. More accurately, these are "feral carrots," originated by garden carrots that escaped cultivation and genetic maintenance by people. And yes, professional flower growers do make use of feral carrots.